The Hooded Vulture is listed as Critically Endangered on the IUCN red list. There has been evidence suggesting that the population is declining due to factors such as indiscriminate poisoning, trade for traditional medicine, hunting, persecution and electrocution, as well as habitat loss and degradation. 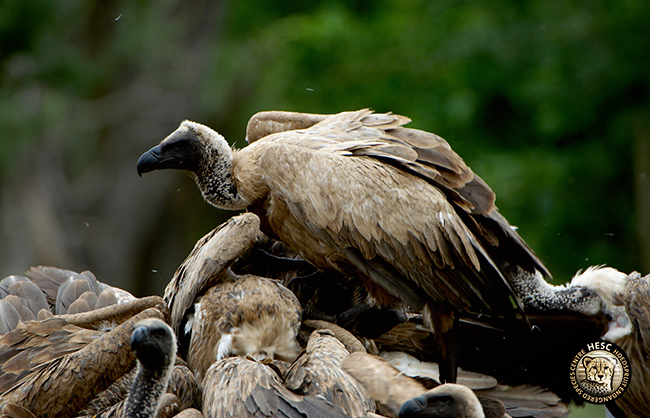 Vultures play an important role in the eco-system. They clean up the environment by consuming animal carcasses, thereby reducing the spread of diseases. The Kruger-to-Canyons (K2C) Hooded Vulture Project began in 2015 and is a collaborative effort between several international partners. Heading the project is researcher, Lindy Thompson, and her supervisor Prof Colleen Downs who are both based at the University of KwaZulu-Natal in South Africa. They work with Andre Botha from BirdLife International and the Endangered Wildlife Trust, Dr Keith Bildstein from Hawk Mountain Sanctuary in the USA, and Dr Campbell Murn from Hawk Conservancy Trust in the UK. The K2C Hooded Vulture Project aims to investigate the breeding biology of these endangered birds, their nest site selection, factors affecting their movements as well as their feeding ecology. The feeding ecology is where HESC comes into play. We have afforded the K2C Hooded Vulture Project access to our vulture restaurant. The team has installed a camera trap (a remotely activated camera that is equipped with a motion or infrared sensor) at the vulture restaurant and return once a month to replace the batteries and SD card, and check the findings. We are one of five premises in the Lowveld that are participating in this research. Analysis of the photographs from the vulture restaurants has not yet begun. It is extremely important that vulture restaurants offer safe food to their ‘visitors’. The meat should not contain any lead shots or other harmful chemicals (for example: all NSAIDS – Non-Steroidal Anti-Inflammatory Drugs – are toxic to vultures except for Meloxicam). 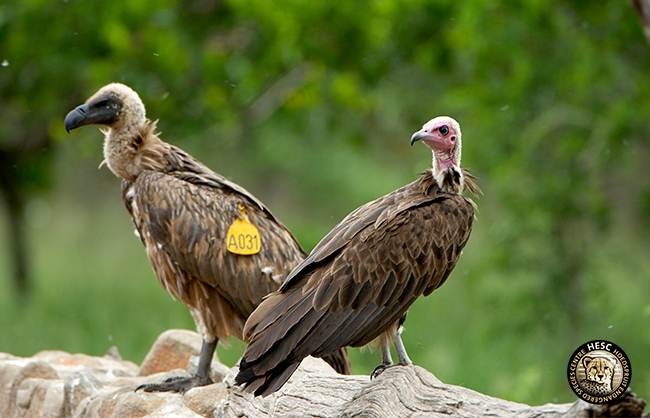 Our vulture restaurant is one of the few areas that offer a safe feeding site to Hooded Vultures. The project is progressing well and some very interesting observations have been made. The researchers have also noticed various other species coming to visit the Hooded Vulture nests. These include Pels’ Fishing Owls, Lesser Galago, Verreaux’s Eagle Owl and Egyptian Geese. Sadly, natural predation seems to be quite a big problem for Hooded Vultures, although so far this is based on observations made during only one breeding season. The researchers anticipate more information to become available in December this year, which is the end of the second year of monitoring. The K2C Hooded Vulture Project researchers have expressed their gratitude to HESC for our involvement and support. We are honoured to be part of this important research; and look forward to working with the researchers for at least another year, as we carry on with our mission for the conservation of endangered species.